Mike Gleason: It is my privilege now to welcome back Michael Pento, president and founder of Pento Portfolio Strategies, and author of the book The Coming Bond Market Collapse: How to Survive the Demise of the U.S. Debt Market. Michael is a well-known money manager and a fantastic market commentator, and it's always great to have him here on the Money Metals podcast. Michael, welcome back and thanks for joining us again. Michael Pento: Thank you for having me back on. Mike Gleason: Well, Michael, you have recently written about why current problems in Turkey are definitely worth paying attention to. There are some similarities with the Asian crisis of the late 1990s which had ripple effects around the globe. The entire developing world is drowning in dollar denominated debt. If there are defaults, lenders in the first world, including major banks in Europe and the United States will have a real problem. Now, there have been a number of brief panics in recent years over the potential for default in places like Greece, Italy, Argentina. Officials seemed to have been able to kick the can and avoid a full blown crisis, but one of these days people are going to be surprised and find out the reckoning for all the borrowing and debt has finally arrived. Turkey's economy dwarfs that of Greece, so what do you make of the current events there, Michael? How serious are things really? Michael Pento: Well, Turkey is only 1% of global GDP is like to say there are 100% of the problems extent in the world today. Mainly, they just borrowed too much debt. Most of that debt is in dollars. As a matter of fact, the total dollar denominated debt is 11 trillion outside of the U.S., and that's up 83% since 2009. And one-third of that is owned by emerging markets. So when the dollar rises, it puts a lot of stress on emerging market currencies, and emerging market economies. And the truth of the matter is emerging markets aren't even that much different than the developed world. And you could throw China in that mix too. There's an increase of $70 trillion worth of global debt since 2007. That's an increase of over 40% and it all hinges on one thing, Mike. It all hinges on the fact that interest rates can never be allowed to rise much above zero, for if they did the entire artificial edifice comes crashing down. Mike Gleason: You examined the yield curve very closely and have long talked about how an inverted yield curve is usually a danger sign and leads to recession. What's the latest there, Michael, and what are you seeing with short term and long term rates? And is a flattening or inverted yield curve still a big concern of yours? Michael Pento: Well, it was a big concern of mine, but of course, the carnival barkers on Wall Street are quickly dismissing the fact that the yield curve now, the spread between the 10-year note and the two-year note is just 22 basis points. That is by far the lowest it's ever been outside of the great recession. And the reason is very simple why we're concerned about this. Nine of the last ten times this has occurred since WWII, the economy entered into a very steep recession, and the reason for this is always the same. People argue, well, the yield curves inverting for reasons that are mechanical in nature, it has nothing to do with the fact that the global economy might be slowing down. Even though if you look at emerging market economies and their currencies, and stock markets they're in various degrees of plunging. The yield curve is inverting as it always does because the Fed is raising short term interest rates. But here's the question, why is it that the long term interest rates across the world are falling still, if we are in a global synchronized boom or recovery as the carnival barkers like to call it? I mean, why is the 10-year note now well below 3%? It's just about 2.83% today? Why are the long-term bond yields falling in the spectrum of global growth, considering the fact that we have massive issuance of new debt, and inflation year over year is 2.9%. So, if you have a global growth, you have U.S. growth, you've got inflation, a huge supply of treasuries, and yet the yield is falling. So, the yield curve is going to invert. It's 21-22 basis points away from inversion right now. That's maybe one or two rate hikes, 25 basis point rate hike away from inverting. And at the point of inversion the Fed funds rate will stay where it is around 2.5% by the end of this year. They'll go in September, they'll probably go in December. That's my best guess. Then the long bond will retreat back towards where it was in 2016, about 1.4%, and the yield curve will be very, very inverted, steeply inverted. And what happens when the yield curve inverts? Why is important? It's a good question that you asked. It's because the credit channel gets shut off. That liquidity pump gets turned off. In other words, if I'm a shadow bank or a regular bank and I'm paying more on deposits or my commercial paper loans, than I can generate on my assets, or my income bearing loans, I stop lending money. The fuel behind asset bubbles dries up, and you get a recession. That's where we're headed. Mike Gleason: A big part of this Trump rally in stocks is in large part due to the massive amount of stock buybacks that have occurred by many corporations, who have borrowed money and done so at a very cheap rate, thanks to these low interest rates. That that has driven a huge amount of demand for stocks and is kept stock prices propped up. So now that we appear to be staring at a couple more rate hikes, do you see this slowing down as the corporations can't borrow money as cheaply as they could? And could that be the straw that breaks the camel's back in this long stock market rally? Michael Pento: Well, it's one of the things I'm worried about for the fall. There's many things that are happening in the fall that's going to bring this, I believe, the stock market down. I can go through that litany with you, but I hear on CNBC� I try not to listen to the channel with the volume on, but occasionally I do make the mistake of putting it on� so, people are talking about the stock market being cheap because it's only 17 times next year's earnings. But they only look at that metric of earnings per share, and PE ratio without looking at why the EPS is so "low in their eyes." And it's exactly what you said, it's debt fueled debt funded corporate buybacks. But if you look at other metrics ... by the way, 17 times forward earnings is not cheap, especially when they're manufactured by the fact that corporate debt as a percentage of GDP is at a record high, and the corporations took on this debt to buy back shares. But if you look at things like price to sales ratio, median PE ratios, total market cap to GDP metrics, the market is the most expensive it has ever been. And one of the things I'm worried about happening this fall, and into next year is that the earnings per share comparisons get downright ugly. So, instead of growing at 25% year-over-year, they're going to be low single digits, and that is precisely due to rising debt service costs and the rising dollar. And that is why I'm worried about a sharp slowdown in EPS growth, year-over-year comparisons are horrific next year. And that takes one of the big stools away from the economic and stock market recovery. Mike Gleason: President Trump made news recently for being critical of the Fed's move to tighten interest rates. It's interesting because as we've talked about before, Trump as a candidate was critical of Janet Yellen and the Fed for being too political. He accused them of maintaining artificially low interest rates at the behest of President Obama in order to help Democrats and Hillary win. He seemed to recognize the problem with too much stimulus, and even mentioned gold and on honest money a time or two. However, President Trump has done a 180. He wants the Fed to give him a handy. We can assume politics and election concerns are driving him to ratchet up the pressure on Jerome Powell, at least in part. What do you think of the President's recent criticism? Do you expect it will have any effects? I mean, maybe it's a near certainty, at least we think, that they're going to hike twice more? Is there time to adjust that? Michael Pento: I don't know. I mean, the Fed minions they just said news just came out from their latest meeting and I think Jerome Powell might have taken a step towards the dovish side. Saying he's concerned about trade wars, but you know, here's the thing. The Fed has no choice, as I mentioned, the year on year rate of consumer price inflation is up 2.9%. Now, that's even way above the Fed's fatuous 2% target. So, the Fed has no choice but to react or they risk a spike in long-term borrowing race, which is the last thing they need. Now, a spike in rates would mean to the yield curve didn't invert, but it would also mean that the housing market, which is on life support, is going to roll over big time. We just got a report out today on existing home sales. They're down four months in a row, and they're actually, existing home sales are, down year on year. Now, how healthy ... Trump likes to extol the economy being the best it's ever been. Mike, how healthy can an economy be if the biggest part of the economy, which is real estate, and the biggest part of real estate which is existing home sales is down year on year? So, the fact is that the last thing this economy can sustain is a spike in interest rates, and it's exactly what would happen if the Fed were to stop raising interest rates. So, the Fed is caught and they say it's caught and backed itself into a corner. If they were to stop now hiking rates, not only would they look like a puppet of the Trump regime, but they would also risk having inflation and asset prices go even more hyperbolic. More off into the twilight zone. And don't forget, as I said, the market cap of equities as a percentage of GDP is 145%. Now, it was 110% in 2007 and that ties the record set back in March of 2000, the 145%. Let's look at home prices for a second. The home price to income ratio peaked at 5.3 in 2005. It's now back to 4.7, and the average of that ratio is just three. So, how much longer can the Fed sit back and not shrink its balance sheet or see shrinking its balance sheet� there was even talk about that today in the meeting about how much longer they can shrink the balance sheet, even though they just barely began shrinking the balance sheet. When the balance sheet went from 800 billion to 4.5 trillion, imagine you, how could anybody have faith in any fiat currency if the Fed is almost on the precipice of admitting that they monetized, permanently, nearly $3.7 trillion worth of bonds and assets? That lends itself to confetti. In Venezuela, it takes a stack of a bolivars, about three feet high, to buy a roll of toilet paper. Is that the fate that the U.S. dollar is supposed to undergo? Is that what the Federal Reserve wants to do? Is to admit that the permanently monetized trillions and trillions of dollars of government debt, and mortgage back securities, and will never unwind that, and only increase the balance sheet. I mean, we have to defend the value of the dollar and it looks to me like that's not what's happening. I think Jerome Powell might be succumbing to a Mr. Trump's duress. However, I will say that I believe he's going to go two more times, at least two more times, and I think it's too late. I think that still inverts the yield curve, and that still brings about a recession. Mike Gleason: Do you envision the trade wars coming to an end anytime soon here? I mean, it does appear that the rhetoric is ratcheting up, not tamping down. Is this just a bargaining tool by Trump that will result in a truce here or will result in a truce here, or will this whole thing implode? Michael Pento: Well, one gets in trouble trying to manage money by the Twitter handle of Donald Trump. So, here's what I do know, and I have friends in the administration who I glean information from, and I don't have any insider information, I'll tell you that. But what I can tell you, what they have said publicly is that Donald Trump really wants to change the direction of trade deficits for this country. He was elected to rebuild the middle class and to clean the rust off of the rust belt. And that means he wants to build, or rebuild, the United States manufacturing base. And to do that, he needs much better trade deals. And I think that's what he's going to try to do. So, like I said, day to day the Twitter feed vacillates between where we're putting 25% tariffs on automobiles to we're about to shake hands with Canada, Mexico, and we're meeting with the Chinese delegation and everything's going to go well. Listen, if there is a trade settlement in the next few months, I believe it will be a very hard to accomplish because of the fact that Trump wants to rebuild America's middle class. And China is not going to acquiesce to a major change in international trade with the United States right before the November elections. It's just not going to happen. It would be a stupid thing for them to do. They'll wait to see if the House of Representatives goes over to the Democrats, that would weaken Donald Trump's hands, and then they pretty much know they have to just sit this out for another two years. And then emperor Xi can go back to doing what he does best. So, no, I don't think we're very close to reconciling. In fact, I think we're very far away from reconciling all of the trades spat. Mike Gleason: What do you make of the recent breakdown in precious metals here, Michael? And what will it finally take for the metals to get moving to the upside again? Everything is going down against the dollar as a result of these trade wars, which seem to be helping the dollar short term. Does that continue to weigh on metals and other commodities, and will this corrective period persist? Or do you see it bottoming here and gold finally getting a bounce? Michael Pento: Well, Mike, I don't think the trade wars have much to do with gold's demise really at all. The dollar was rising before we had trade wars. Mike Gleason: That is true. Michael Pento: The reason why I believe the gold has been suffering, first of all, you have a massive short, a record short on speculators and hedge funds in the price of gold? I believe it's all about what it's always been about. It's about the rising U.S. dollar. And you have to ask yourself, "Why is the dollar rising?" Well, it's because we were enjoying a dramatic entrenching growth differential with that of emerging markets in Europe and Japan. So, if that continues, I expect the dollar to continue to rise. We also have a central bank which is way further ahead than the other central banks in their tightening of monetary policy. So, the Fed has stopped QE, has raised rates seven times, is going to do it for the eighth time in September. The Fed is draining its balance sheet, whereas the Bank of Japan is still on full bore QE. The ECB has halved its QE but has yet to raise interest rates. They might have it again in October to 15 billion euros a month. But they're still quarters away from, if that, from raising interest rates. So you have trenchant interest rate and monetary policies, and huge growth gaps. So, that's what's hurting gold, plus you have all the shorts of piled on. So, if you asked me my opinion viscerally, I feel that gold's ready for a bounce, at least the short-term bounce in the very near term. Longer term, we're going to need the Fed to capitulate and I think that's when the Fed stops raising rates, when the yield curve inverts, and I'm looking for that, a long-term, maybe secular trend rising in gold prices to begin sometime in early 2019. Mike Gleason: Well, as we begin to close here, Michael, any final thoughts or anything that you're watching most closely that maybe we haven't covered yet? Michael Pento: Well, of course I'm watching what's going on with China. I mean, people will say, "Turkey was isolated." You started the interview talking about Turkey. Everybody tells me Turkey is an isolated condition, but as I said, Turkey represents 100% of what's going on in emerging markets. Too many dollar-based loans, too much debt, very susceptible to a rising U.S. dollar, very susceptible to rising interest rates, and very susceptible to a slowdown in economic growth. And China is slowing down. China had two major credit waves since 2007. They had a huge one in 2008, another one in 2015 and 2016. They now have the most destabilizing credit bubble in the history of the planet earth. And they're sitting on a $30 trillion in debt. That debt is up 56% in the last five years. It's very hard to find any comparison in the world where you have a country that has increased debt by over 50% in five years. Very, very difficult. So, the entire world is hanging in clinging to the belief and hope that interest rates can never rise. Now, Mike, interest rates have to normalize because either A, the central banks will pop the interest rate bubble, the bond bubble by raising rates. That's the de facto popping of the debt bubble, and the bond bubble. Or they do nothing. They sit on their hands and inflation will pop the debt bubble, and spike interest rates. So it's either one or the other. So you pick your poison. But one of those two things will happen, which means interest rates will normalize, and that means massive deflationary debt faults pervading across the globe. That's why I mark, and map and model here at Pento Portfolio Strategies, making sure I'm on the right side of the trade between growth and deflation and inflation. If you can pick the right sector, I've got five sectors in my model. If you can pick the right sector, you'll be much better off than those who will just always long the gold, and always short the dollar, or always long FANG stocks. Those are prescriptions for penury. Michael Pento: You can go right to my website. It's pentoport.com. You can get yourself a free trial for the Midweek Reality Check. 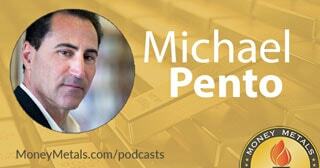 I also put out a weekly commentary called Pentonomics. You can email me directly at mpento@pentoport.com. You can call the office here at 732-772-9500. Mike Gleason: Well, thanks again Michael. I hope you enjoy the last part of your summer and we'll look forward to catching up with you again sometime this fall. Take care.